A heavily traveled stretch of Augusta's Western Avenue some locals call "the rumble strip" should be a smooth, wide ride once a reconstruction project starting Sept. 30 and set to end next summer is done. AUGUSTA — A heavily traveled stretch of Western Avenue some locals call “the rumble strip” should be a smooth, wide ride once a reconstruction project starting soon and set to end next summer is done. 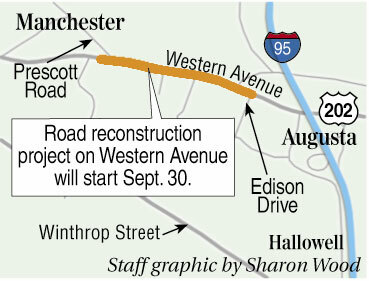 But things could be far from smooth during the reconstruction of about half a mile of the west end of Western Avenue between the Manchester town line and Edison Drive. Crews will widen the road, improve drainage and add new turning lanes while rebuilding the road. Meanwhile, the road’s average daily total of more than 23,000 motorists will weave through the work. Work is scheduled to start Sept. 30 with tree clearing and drainage work, ending for the year with underground utility pipe construction this fall before the ground freezes. The project will resume in the spring with road preparation and paving, and it is scheduled to be done by Aug. 30. Ron Lovaglio, a resident of Smith Street, which enters Western Avenue in the heart of the potholed stretch targeted for reconstruction, said he’s heard rumors the state planned to reconstruct the stretch of road for about 20 years. Ward 1 City Councilor Michael Byron, also a resident of Smith Street, tried unsuccessfully to get the city to put down a thin coat of pavement on the road last year. He said he and his neighbors are happy the work appears to finally be about to begin. Shawn Smith, project manager for the transportation department, said the contract for the $3.8 million project placed an emphasis on minimizing disruptions to the thousands of commuters who come from west of the city in the morning and return home in the early evening. 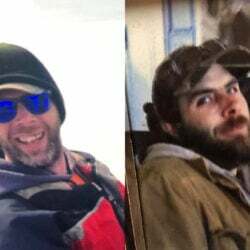 The contractor on the job, R.J. Grondin and Sons of Gorham, will be required to keep both eastbound lanes open during the morning peak commuting time, and both westbound lanes open during the evening commute peak. During other daytime work, travel may be restricted to one lane in each direction. When night work starts, likely not until the spring, traffic will at times be restricted to alternating one-way travel. Talbot said no Saturday work will take place during the project, but the contractor has the option of working on Sundays. The no-Saturdays provision, he said, was to address concerns about the impact of the project on the car dealerships that line that stretch of Western Avenue. Part of the road will be widened by up to an additional 28 feet and left turn lanes will be added to both sides of the road by Shuman Avenue and Nancy Lane, side roads which provide access to Charlie’s Motor Mall dealerships on both sides of the project area. Smith said there is no turn lane for those making a left turn, so cars stop in the travel lanes, blocking traffic. He said all businesses in the project area will remain open, and will have access, throughout the project. Underground infrastructure work to be done this fall is expected to include Greater Augusta Utility District work on water and sewer lines, and installation of gas pipeline for Summit Natural Gas of Maine. A new traffic signal will also be installed as part of the project. Talbot said the transportation department will monitor traffic conditions during the project and make changes if needed.